Never judge a book by it's cover. This is something which can be applied to any field and any situation and even metal is not an exception. I say this because every time I listen to this band, I am reminded of how I first got introduced to them. It happened a few months back when I was attending Black Metal Krieg 3. Although I was familiar with most bands on the roster, Insane Prophecy had always been that one band which I had heard only in passing and never really paid serious attention to. So when a couple of short, nerdy looking kids got on stage, I was quite surprised and completely oblivious to the hell these guys were about to unleash. So that's why I say, never judge a band based on their looks. Insanse Prophecy is a band that hails from Guwahati, Assam, India and like most metal acts from the North East, this band sounds heavy and brutal. So far the band has a sole release to it's credit, an EP titled 'Apogee of an Inquisition' which came out sometime in 2012. Insane Prophecy is one of those bands that know how to make a good mix of black and death metal by utilizing the best of both genres. This is a fact that is well represented in this four track EP. It starts off with the track 'Blapshemy ov a Diabolic' and the black metal influences become immediately apparent. But as the track progresses, death metal influences creep into the music, making it a very intense mix. The twins Xulfi Nawaz and Ifty Sarwar share a tight chemistry when it comes to music. They have contrasting style of vocal where one growls and the other shrieks. The two styles come together to form a beastly combination. Aiding the twins on the guitar parts is Bikash Subba who unleashes some mighty riffs. Good thing about these riffs is that they are both brutal and easily memorable. The band also manages to show its softer side on this EP as they conclude it with an instrumental piece comprising of clean and melodic guitars. Apart from this instrumental, the rest of the tracks are fine specimens in good and catchy song writing. The production is done by Siddharth Barooa (Lucid Recess) and everything sounds the way it should - clear, audible and a bit raw. This EP also features one of my favorite album covers in the Indian scene as it is simple, effective and dark. 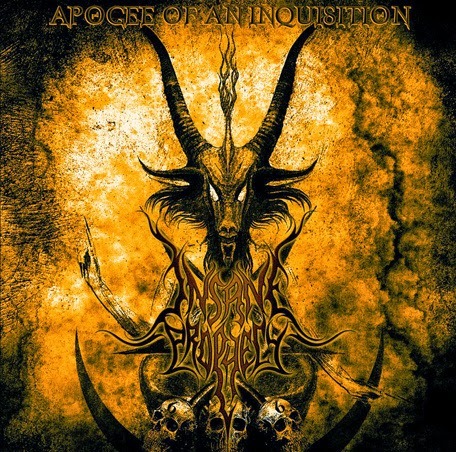 'Apogee of an Inquisition' is a mighty fine debut by these lads. Hope these guys go on to release more such quality records in the future. Insane Prophecy will be a part of the line up at Transcending Obscurity Fest, which is scheduled to take place on the 11th of May 2014, at Hotel United 21, Mumbai.